You probably don’t know the difference between regular and protective motorcycle boots. Let me give you some insight. Me, on our 2007 Triumph Speed Triple. Wearing Daytona Ladystars. This bike is so tall it still didn’t give me one flat left! But the little bit of traction I was able to use was extremely helpful when I had just my left foot down at stops. It starts with your feet. When you first sit on a motorcycle, what's the first thing that touches the ground? This simple action sends a strong message from the bottom of your feet to your brain telling you either "Oh X@#%^!" or "Oh Yes!!" Before I dive in, I also want to mention how the right boots have helped me ride much taller bikes. 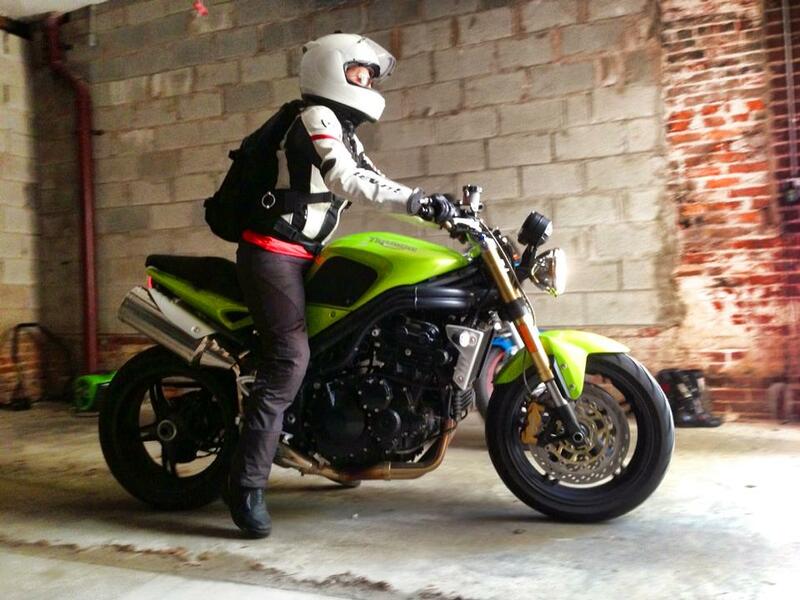 Click here to read my article about Motorcycles for Short Riders. Maybe you're a new rider, or maybe you've been struggling on a bike that you know you can ride/manage but could use a little extra help. Riding boots can make a huge difference in your riding confidence and comfort. So what are you going to look for when you’re shopping for boots? What are the key differences and features that you need to be aware of? This rider was going maybe 10-15mph? If only the rider had on more gear, like proper boots with a zipper/velcro system to keep the boot from flying off even at such a low speed. You’ll notice that this system is often on the side of the boot (maybe the back), but not right in front. Velcro and zippers are a girl's best friend. Impact points. Knock on these zones, does it knock back? How much do you trust your boots? Keep (parts of or all of ) your foot from being crushed. We don't have to be doing very much for a 400lb bike to sprain, fracture or break your ankle. Just imagine backing your motorcycle out of the driveway, with slippery pavement or oil and losing your footing and dropping the bike just while moving it? What is there to protect your ankle bone from being crushed by the weight of the motorcycle? Now add a little velocity and force to that in the form of riding anywhere from 5mph-50mph and see what happens. My boots are SO strong that if I lay them on their side that I can stand on them without them collapsing under my feet. Look for CE Rated Boots, because this also tells you that they have been tested to withstand up to 400lbs of this kind of crushing pressure. That doesn’t mean boots without a CE Rating won’t protect you, it’s just something to look for that tells you right off the bat that they are fully designed to do their job. This is a photo of my Sidi boots after I lowsided in them on a 40mph curve (on a backroad). The strength of this boot is what saved me from strained, fractured or broken bones. I didn’t have any of that, at all. The only thing I had was a little swelling on the top of my foot and a bruise. Try this. Put on your sneakers. Assuming you have NO flat feet on the ground, try pushing your motorcycle forward 10 feet. How long did that take you? 20-30 seconds? I’m guessing longer. I may not have height but I always have leverage. Like on this Street Triple, Goldie’s twin. I only have the ball of my feet but the amount of traction I can leverage in such a small contact patch is fantastic. The traction you can gain within the ball of your foot can be more than what you'll get in the entire sole of a casual shoe. You've also probably been told that you "must" flat foot with both feet on your motorcycle. Well, I don't know who wrote that rule but I've never flat footed any motorcycle or scooter I've ever ridden. However, that's not to say that you should be attempting to ride something beyond your experience level. But, it is possible and it can be done, if you go about it the right way. For me, that was starting on a 50cc scooter that only weighed ~200lbs and then a motorcycle that weighed 325lbs, and then another motorcycle that weighed 450lbs (very top heavy too) and finally back down to a gentler 438lb beast with a much lower center of gravity ('03 Suzuki SV650S. *swoon*). I never flat footed both feet on any of these bikes and I couldn't have ridden any of them without wearing a great pair of boots to offer me the added traction. I never imagined that real riding boots would help me ride better and more often. So what can a protective boot offer you in addition to protection? Function! It can do more than just look good. 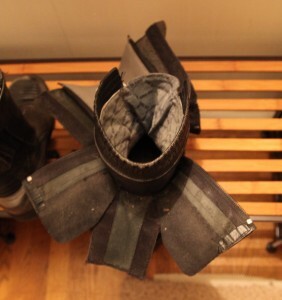 Adjustable Fit; Some boots have larger calves to accommodate pants and different leg shapes. Or, we might have leather pants that are tapered for tucking into boots. Like my Daytonas above that open completely around the calves. Bonus for the ladies out there who need more room in their motorcycle boots. Weather Proofing. GORE-TEX® is a magical membrane that provides incredible breathability. I have found that there's something amazing about the way it can insulate when it's cold and allow just enough breathability when it's hot. I've worn my Daytonas between 35 and 100 degrees fahrenheit (no humidity). Of course, I'm also wearing smart wool socks in the winter and moisture wicking socks in the summer to help manage the temperature of my feet (cotton doesn't cut it). Calf adjustment on the Sidi Vertigo Lei boots, these also open (more than shown) to allow for track suits or pants. Zippers and Velcro; are one of the best manmade inventions, ever! Besides making it really easy to get your boots on and off, and at the same time they're going to provide a very secure fit. You'll also find some boots have a velcro zipper pull that attaches to the top of the boot where a velcro flap secures around your calf. You might also see a velcro flap over the zipper so the zipper can’t become undone on its own in the event of an accident. Generally, you're going to see laces on more casual looking motorcycle shoes/boots that are fine for stop signs, but not the best option for freeway/weekend riding speeds. So how should your riding boots fit? Well, they should fit snug, just like everything else. One thing to be remember is that most likely, your boots are going to be made of some sort of animal hide, most commonly cow. Cow hide stretches out after you break them in, so initially you want to find a boot with a snug fit so that when they do break in, they will fit just right. Never buy boots the way they feel in the store, but how they will feel 2-3 weeks / 100-200 miles from now. It’ll certainly depend on the brand and style, but some synthetics (like my Dainese, right) do break in too. Keep in mind that your boots should be so snug around the ankles that it keeps your foot from sliding back and forth. If you have narrow ankles but are trying on a boot with a larger ankle space, then it'll never be fully secure. Different boots have different fitment profiles (e.g. Sidi/wide, Dainese/narrow, Alpinestars/wide footbed, narrower ankle) and it's important to find the right for your foot type (just like the rest of your body). Your foot position is going to change while on the pegs, off the pegs, breaking and shifting. See how your foot feels while doing all these things. If you can feel your foot moving sideways or back and forth inside the boot, consider going down a size. It's normal for your heel to move around a little bit, because you need a little bit of wiggle room there when you move your foot from the pavement to the pegs. Take a step and then see if the boot is wrinkling too much above the toes, similar to when you try on a pair of shoes that are one size too big. If that looks fine, make sure that you can't move your foot side to side. They shouldn't be squeezing your foot but just know that they will stretch out in WIDTH and never in length. My feet are literally Rectangles. 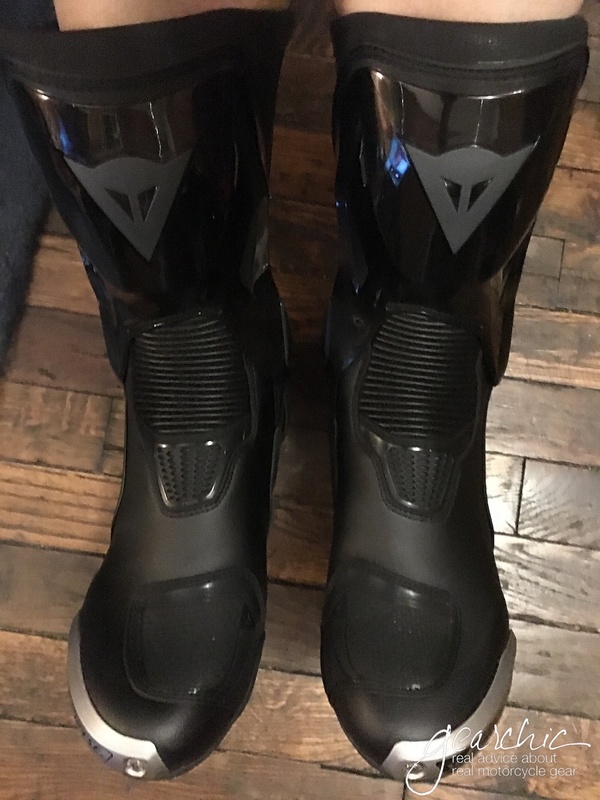 So I sized up once to fit my Dainese since they’re so narrow. This photo was taken a couple days after my accident several years ago wearing my old Sidis. Just some bruising and swelling, no breaks/fractures/sprains. You should also notice that when you walk normally, your feet don't move around from front to back like they might in a normal shoe. Dainese/ great for skinny ankles/calves and low arches/insteps and flat feet. It's a narrower shoe which hugs your foot/ankle/heel all over. They're most comfortable boots are the TRQ TourGTX, Nighthawk, Fulcrum and Long Range WP because they have Skywalk soles made for walking! 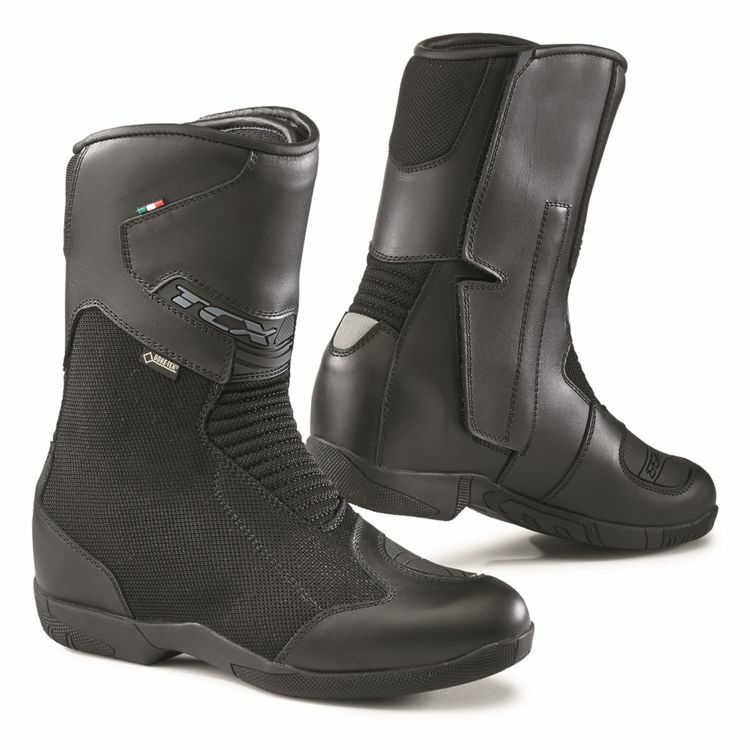 And btw, the TRQ Tour are the most protective street boots because they offer full torsion (no ankle twisting) control. No other touring boot offers this. TCX and Sidi/ Fit profile is wider and large in the ankle/heels/calves/instep. If you need a phatter boot, you want one of these brands. Alpinestars/ Fit profile is an interesting blend of TCX and Dainese. I feel like they give you a wider toebox but a more fitted ankle/heel space and not as roomy as Sidis in the ankles/heels. Overall any "shoe" style will fit looser, like a casual shoe. Anything that's barely above your ankle likely won't have adjustability in the ankles/calves so if you have skinny ankles they'll swim on you. American brands like Icon/Firstgear/Cortech/etc they will mostly have wider fit profiles everywhere and be looser overall. So I would avoid them if you have slender/narrow feet or want a snugger fit around the ankles/legs. Of course, men’s boots will offer the most room overall but not necessarily when it comes to calves. As always, I’m here if you need me so please contact me with questions/concerns or feedback. Ride Safe!